For 30 years Europe’s Fisheries Ministers have made poor decisions that have resulted in overfishing, sending our fishing industry into decline. Now many European fishing fleets concentrate their fishing efforts elsewhere, increasing the pressure on fish stocks globally. If this continues we will bankrupt our oceans and our fishing economy. This month all that could change as the European Parliament’s Fisheries Committee debates and votes on the future of our oceans. They have an opportunity to correct decades of mismanagement. Let them know their vote is vital. This week WWF launched a short animation and e-action to various MEPs on the Committee asking them to support progressive reform. 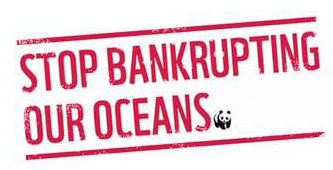 Take action at www.wwf.eu/stopbankrupting and choose your country and then pass this message onto colleagues and friends.